If you’re going to run with your child — and I mean really run, with serious training sessions, multiple times per week — then you want to put the cash down on a serious jogging stroller. You need it to track straight. It should roll almost effortlessly along with the slightest of nudging. And your kid should be cozy and safe inside. This is one product, I will say from personal experience, that isn’t worth compromise, even when the price of a good jog stroller can run $349. That’s right, for the BOB Ironman Sport Utility Stroller, a model I’ve been testing for two months, you’re going to pay a lot. A price like $349 is about as much as I could ever see myself paying for a child-pushing device. 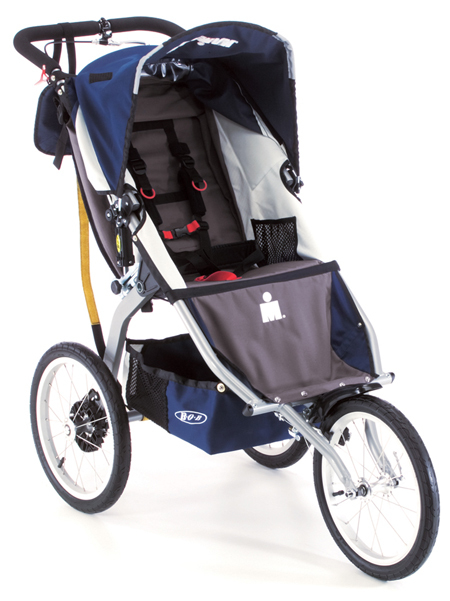 But the stroller, which weighs 21 pounds and was introduced in 2004, is worth the cash for serious runners. It tracks straight and rolls effortlessly down the paved path. Little pushing is required once momentum takes over, just a steady hand on the grip bar. The stroller has stiff suspension that helps with maneuverability and response while jogging. Its 16-inch aluminum wheels come with high-pressure, slick road tires to provide a smooth, seamless roll on sidewalks and trails. For the kid sitting inside, the seat is comfortable enough. There are cup holder pockets. This year’s iteration of the Ironman Sport Utility Stroller (www.bobgear.com) includes an increase in seat padding for extra comfort and support and an extended seat recline that offers a 70-degree tilt from the stroller’s upright position. My two-year-old daughter often falls asleep while we are on a run, and the generous recline allows me to subtly undo two buckles for her to lay back and snore. Another nice feature is the stroller’s large canopy, which folds to enclose your kid in a shady seated oasis. The stroller isn’t perfect, though. For example, the caliper hand brake for the front tire is kind of low-grade. Mine’s needed a couple adjustments already. I’m not a fan of the foamy handlebar grip. Once you start to sweat, the foam gets kind of nasty and looses some grip. It’s also too warm and insulating for holding constantly on a run in summertime temps. I wish the designers at BOB had thought out the placement of the brake cable. It lays on the back side of the grip, above the foam, and your hand is in constant contact with that small bit of cable piping. No biggie, but it does become noticeable on a long run where you’re gripping the handle for 45 minutes or more. Overall, this stroller has many more ups than downs. If you’re going to put it to serious use, and if you can afford it, the BOB Ironman Sport Utility Stroller will not often disappoint. next:New Gear Review Columns Posted!